While Tamil poets, students and activists belonging to all Tamil nationalist movements in Tamil Nadu marked LTTE leader Velupillai Pirapaharan's 60th birth anniversary, political activists marked the day with planting trees at the birthplace of Mr Pirapaharan at Valveddithu'rai in Jaffna. The birth anniversary was also observed in several cities in the West. Eezham Tamil environmentalist and Northern Provincial Council (NPC) agricultural minister P. Ayngaranesan, NPC Councillors Ms Ananthy Sasitharan, Mr Gajatheepan, Mr Sugirthan, Valveddiththu'rai Urban Council president Mr Sathees planted trees at Aaladi, the native place of LTTE leader V. Pirapaharan and in Valveddithu'rai town area. The NPC councillors also distributed hundreds of trees to the public to be planted amidst the harassing presence of the occupying SL military soldiers. The people were also seen distributing sweets and firing crackers despite the threats by the SL military. 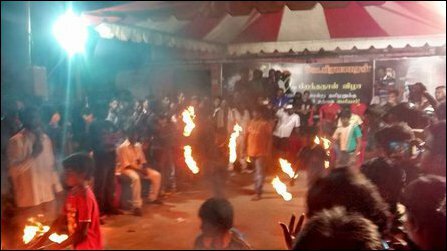 In Tamil Nadu, students, poets and activists marked Pirapaharan's birthday on Wednesday and were mobilising with increased resurgence in marking Pirapaharan's birthday. Tamil legal activists were actively assisting the Tamil students in Chennai and Mathurai during their mobilisation in marking the birth anniversary of Pirapaharan on Wednesday and Tamil Heroes Day on Thursday. Tamil Nadu Police has been instructed to block the students and activists from mobilising on Tamil Eelam Heroes Day. An activist belonging to Dravidar Viduthalai Kazhakam, Umapathy, was detained and brutally attacked by the police when he protested at the police removing Heroes Day banners at Iraayap-peaddai (Royapettah), a suburb of the city of Chennai. 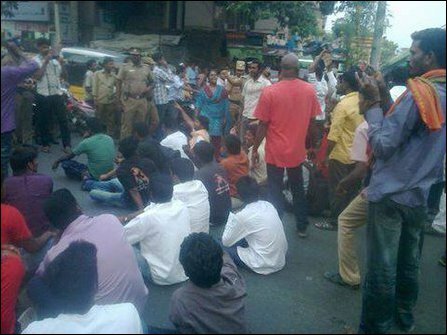 The activist was admitted as hospital after protests and roadblocks by the activists, news sources in Chennai said. 28.11.15 Colombo withdraws police protection to NPC members..
27.11.15 Fallen Tamil Eelam sea fighters commemorated in No..
27.11.15 Occupied Tamil Eelam marks Heroes Day amidst ‘Sri ..
27.11.14 Heroes Day in London highlights global significanc..
26.11.14 Tamil youth interrogated for alleged possession of..
26.11.14 SL military deployed everywhere, Jaffna University..
15.11.14 US-trained commander of SL military steps up surve..
11.11.14 UNP leader calls on EU to not remove sanctions on ..
18.10.14 Action needed in UK in converting legal victory in..
17.10.14 ECJ implies non-requirement of evidence in ‘terror..
06.09.14 'LTTE ban contributes to further oppression of Tam..
24.02.14 EU made big mistake in banning LTTE: Henricsson, f..
22.02.14 Tamils in UK protest against British role in EU ba..
28.01.14 European Court of Justice fixes hearing date for E..
14.06.13 NESoHR revives reporting, highlights collective ri..
19.05.13 Jaffna University remembers Vanni genocide amidst ..
22.01.13 Two students of Jaffna University released in Vavu..
22.01.13 SL defence takes Jaffna University administration ..
19.01.13 Indian students federation stands with Jaffna stud..
11.01.13 SL military orders civil officials to supply resid..
08.01.13 Less than 50 out of 5000 attended Jaffna Universit..
07.01.13 Jaffna University reopens at the height of intimid..
05.01.13 Jaffna University VC gags academics speaking to me..
30.12.12 Colombo posters wage war against all shades of Tam..
25.12.12 Sri Lanka’s terror abductions, arrests, summons ma..
22.12.12 Tamil youth protest in London condemns repression ..
22.12.12 SL military begins war on Jaffna University teache..
21.12.12 Jaffna University Teachers' Union President summon..
21.12.12 SL Commander threatens VC-led team visiting Palaal..
20.12.12 Deans foil SL military attempt to direct Jaffna Un..
16.12.12 Kurdish grassroot federation in Germany shows soli..
15.12.12 Chain of protests in London against repression of ..
14.12.12 Sri Lanka Defence coerces parents or fabricates st..
13.12.12 SLA summons 4 girl students, house-by-house intimi..
11.12.12 SL military ‘rehabilitation’ for detained Universi..
10.12.12 Colombo hatches new strategies in genocidal war, s..
09.12.12 TID interrogators fabricate accusation against 14 ..
08.12.12 SL “Terrorist” division abducts 18-year-old studen..
08.12.12 Shame on Norway for being silent on Sri Lanka: Red..
08.12.12 Release arrested Tamil students immediately: Paul ..
08.12.12 Canadian youth mobilises global community in showi..
07.12.12 Jaffna University teachers remind SL President abo..
06.12.12 SL police directs Medical Dean to hand over studen..
06.12.12 Sri Lanka intensifies terror campaign against Tami..
05.12.12 Suresh calls upon diaspora youth to respond to Jaf..
04.12.12 Jaffna demonstration backing students demands IC a..
03.12.12 SL military threatens senior faculty members of Ja..
02.12.12 EPC TNA councilor condemns attack on University st..
01.12.12 Paramilitary allegedly backed by India effects arr..
30.11.12 Canadian organizations condemn attack on students ..
29.11.12 SLA attack on Tamil students is ‘additional’ issue..
29.11.12 TNA parliamentarian, university students question ..
28.11.12 Peaceful student protest attacked by SL military i..
28.11.12 Ladies’ hostel lights Common Flame, bells stun SL ..
14.08.11 UK, Netherlands join fight against Koppe's EU Cour..
30.07.11 Court prepares for judicial review as EU continues..
11.06.11 Koppe: Tamil demand for retributive justice justif..
05.06.11 LTTE mounts legal challenge, says post-Mu’l’livaay..